Commemorate a life well lived with our Tree of Remembrance Gift Set by Kitras Art Glass. Each glass globe is carefully made by hand, ensuring a keepsake that’s as unique as the person it’s honoring. 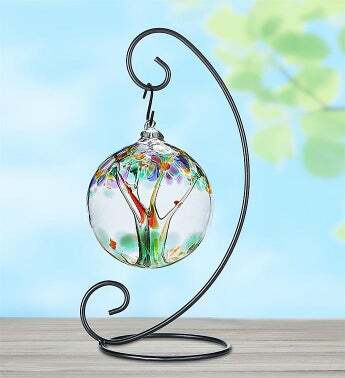 Paired with a stand and hook for easy hanging, this gift’s rich color and stunning beauty will call to mind treasured memories wherever it’s displayed. For more than 30 years, Kitras Art Glass has designed one-of-a-kind glass art centered on connecting people and celebrating beauty in all parts of life. The roots of this family-run company are built around the quality, uniqueness and above all, the beauty of a piece made by hand.